Cancer affects millions of people every year, and the cost of receiving potentially life-saving treatment is typically very high. Fortunately, you can turn to an online fundraising website such as DonationTo in order to ask for some financial support. Our platform is easy to use and makes it possible to avoid some of the most common crowdfunding mistakes. For example, we have numerous tools that will help you raise awareness, including social networking integration. Additionally, your contributors will be able to choose between PayPal and WePay as their online payment processor. Giving people more than one payment option is a great way to increase donations. 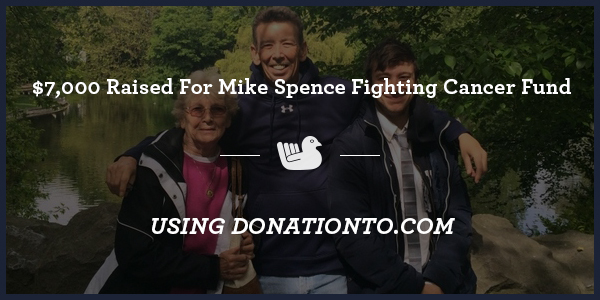 In late May, 2015, Mike Spence was diagnosed with pancreatic cancer. This immediately changed the focus of his life, and it also caused him to begin racking up a large amount of medical debt. Cancer is always an expensive disease, and even the best insurance is never going to cover everything. In an effort to help out, Mike’s son created a with the intention of raising as much money as possible to offset the unexpected medical expenses. More than 100 people came together to raise $7,352, which made the financial aspects of Mike’s cancer easier to manage. Tragically, Mike’s valiant battle against cancer was ultimately unsuccessful, and he passed away six months ago. Although the fundraiser and treatment was unable to save Mike, his family does not have as much of a financial burden to deal with thanks to the generosity of donors. This in itself is an important kindness that can make it easier to grieve the loss of a loved one. After all, the last thing that a family needs after losing someone is to be forced to rush back to work in order to pay for medical and funeral expenses. We believe that one of the major donation website mistakes is failing to recognize the emotional needs behind each campaign. Therefore, we enable each donor to leave a comment along with their contribution. These words of support can be a great source of solace for the family, especially later on when people are less forthcoming with their feelings. Pancreatic cancer is one of the most difficult forms of cancer to recover from, even when it is caught early on. Part of the problem is that most symptoms do not present themselves until the cancer has already advanced past the first stage. Symptoms include weight loss, depression, jaundice, blood clots, loss of appetite and upper abdominal pain. It is unknown what causes pancreatic cancer, but almost 50,000 Americans develop this disease each year. Tragically, 83 percent of pancreatic cancer patients will lose their life within five years of their initial diagnosis. There are a few risk factors that increase your odds of developing pancreatic cancer, including obesity, having diabetes, smoking and chronic pancreatitis. It is also imperative to receive cancer screenings if you have a family history of this disease or the BRCA2 gene mutation. People who eat a healthy diet that contains whole grains and a variety of colorful fruits and vegetables are less likely to get cancer. Whether you are trying to pay for medical bills or funeral expenses, a crowdfunding page is a good resource for connecting with people around the world. Be sure to steer clear of common mistakes raising money online by making your page easily accessible and sharing it via social media. DonationTo’s platform is easy to use and comes equipped with important tools such as unlimited photo uploads and one click sharing. Putting time and energy into your campaign is one of the best ways to meet your goal, and our site makes it possible to get started without any previous experience or special technical skills.